Creativity in business is no longer a luxury, if it ever was. The era of hammering consumers into submission through volume and frequency is largely over. In its place is the surging value of the creative idea—the need, more critical than ever, to find fresh and unconventional ways of thinking about what we make, and engaging people to sell it. 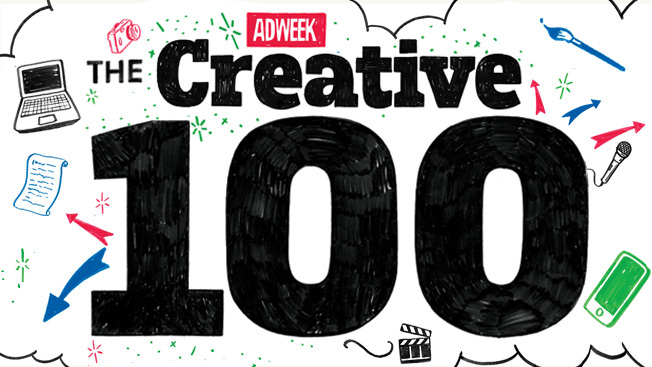 Adweek's inaugural Creative 100 honors the current masters of the creative idea. They are makers of advertising, branded content, technology, products, pop culture and more. And they have one thing in common: They engage audiences with clever, fun, fascinating and entertaining content that's an irresistible force in a time of ultimate distraction. It is not meant to be a definitive list of the absolute most creative people in these industries, nor is it ranked in any way, in some attempt at quantifying creative talent. Rather, it is an evolving mix of senior and junior talent whose work has shone brightly over the previous year. It is also U.S. only, not global. Agency creatives with global roles were not considered, though execs in other industries with some global duties were eligible if they are U.S.-based. Congrats to everyone on the list. May their stories inspire better work across the board.